The Universe originated in a big bang about 13 billion years ago and the Sun and its planets were formed about 4.6 billion years ago … the dinosaurs became extinct about 66 million years ago … humans and the great apes had a common lineage until about 8 million years ago, … Homo sapiens moved out of Africa about 40, 000 years ago …. A fascinating account of the history of the Earth. J. D. Macdougall is a Professor Emeritus at the Scripps Institution of Oceanography of the University of California, San Diego. He has authored many articles and books on Geology. The history of Earth is classified into different units of time called geological timescale, based on studies of fossils and rocks. How do scientists measure time so accurately? Natural radioactivity is the answer. With the aging of the Earth or cooling of the Earth since its birth, life began to form and disappear, giving way to the emergence of new species, there were periods of catastrophes, such as collision of Earth with comets or asteroids and dramatic climate changes – all encripted clearly on rocks and fossils. The geological timescale (see the figure) is one of the great scientific achievements of all time (no pun intended). It is, in effect, a history of the Earth, and it stretches back to the beginnings of our planet and the solar system 4.6 billion years ago. But how did scientists construct the timescale? And how did they measure such immense quantities of time? The first of these two questions is the easiest to answer: they did it by studying rocks. We’ll get to the second question later. When sediments pile up layer upon layer at the bottom of the ocean, or on the bottom of a lake, it’s pretty obvious that the lowest layers were deposited first, the upper ones later. The bottom layers are therefore older than those at the top, and this is true for any sequence of sedimentary rock layers. This observation seems like common sense to us today, but when it was formally proposed by a scientist named Nicolas Steno more than three hundred years ago, it was a revelation. Steno’s principle, as it is sometimes known, is one of the guiding principles behind the geological timescale. Early geologists had no way to measure the “absolute” age of the rock layers, so they had to be content with relative age – lower layers being older than upper ones, and so on. Assigning relative ages was made immensely easier by the fact that many sedimentary rocks contain fossils. When scientists began examining these fossils carefully, they realized that different layers often contained quite different types of fossils. The youngest rocks, those near the top of thick sedimentary sequences, contained fossils that looked very much like familiar, present-day creatures. But fossils further down in these sequences (and therefore older) did not look so familiar, and those in the very oldest rocks were quite different from present-day plants and animals. Some of these old fossils were quite bizarre-looking. These early geologists were seeing evolution in action, although they didn’t know it. At any particular time in the Earth’s history, certain plants and animals were common, and got preserved as fossils. As time passed, however, these organisms died off and others evolved and took over. So rocks formed at different times in Earth history contain their own characteristic assemblages of fossils. As a purely practical matter this was very useful for geologists. If they found sedimentary rocks with certain types of fossils in the United States, and the same kinds of fossils occurred in rocks in Europe, they knew that the rocks were formed at about the same time. 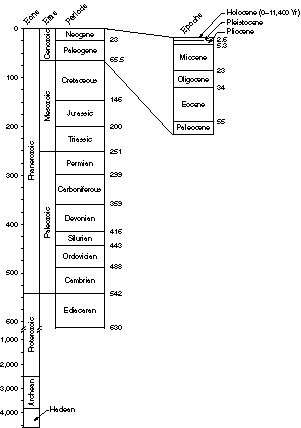 Based on these types of observations, geologists were able to construct an early version of the geological time scale shown in the figure. But they only really had information about the part of the time scale from the Cambrian Period until the present, because only rocks from that interval contained fossils. There were older layers beneath the Cambrian rocks, but these older rocks had no fossils and there was no way to subdivide them. The Geological Timescale, with time shown in millions of years. Note the scale change in the Proterozoic eon. In constructing the time scale, boundaries between periods (from the Cambrian period to the present) were placed where sudden changes in the types of fossils occurred. The early geologists didn’t know why this happened, but we now know that these were times of unusually rapid extinctions around the world, probably caused by great environmental disruptions. Many species died off, and when conditions returned to normal, new ones took over. But how did scientists put numbers on the timescale? How is it possible to say that the Cambrian period started 542 million years ago, or that the boundary between the Cretaceous and Paleogene periods, when the dinosaurs became extinct, occurred 65.5 million years ago? The answer came with the discovery of radioactivity at the very end of the 19th century. Scientists quickly found that there are many naturally occurring radioactive isotopes, and that each one breaks down at a characteristic and constant rate. That meant that they could use radioactivity as a natural clock. The idea is really quite simple. A radioactive substance like (for example) uranium is transformed into something else when it undergoes radioactive decay. For uranium, that something else is lead. So the age of a rock can be measured just by analyzing how much lead has been formed from the uranium it contains, as long as you know the rate at which the transformation occurs. Like most things, this simple idea is more difficult to put into practice than it first appears. For example, what if the rock already contained some lead when it was formed? But scientists have figured out reliable ways to deal with such problems. As a result, it’s now possible to measure the age of a rock that is billions of years old with incredible accuracy. Fortunately, many different elements in the periodic table have radioactive isotopes that can be used for geological dating. Each one of them is characterized by a “half-life” – the time interval over which exactly half of the substance decays away. If a radioactive isotope has a half-life of one hundred years, half of it will decay away and only half of it will remain after the first hundred years. Half of that – one quarter of the original amount – will be left after two hundred years. During each one hundred year period, the amount will be halved. The half-lives of naturally occurring radioactive isotopes vary from seconds to billions of years. That too is fortunate, because generally speaking isotopes with short half-lives can be used to measure relatively short geological times, and those with very long half-lives can be used to measure very old ages. 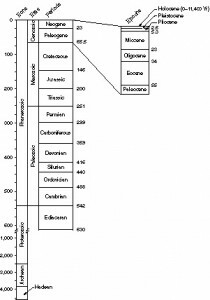 The modern version of the geological time scale shown in the figure, with its precisely determined ages, is based on thousands of individual age determinations using naturally occurring radioactive isotopes. As I said at the beginning of this article, it is one of the great scientific accomplishments of all time because it gives us a framework for understanding the entire history of our planet. It is, to a degree, a work in progress because scientists are continually seeking ways to improve the accuracy of age determination methods, and when a breakthrough is made the age of a particular boundary may have to be revised slightly. But the ages you see in the figure are unlikely to change much. And the relative positions of the subdivisions – the order in which they occur – will certainly not change.